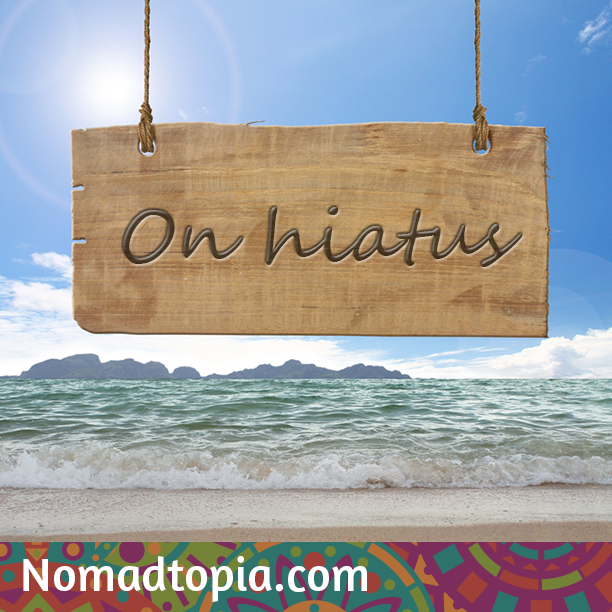 Nomadtopia Radio is going on hiatus! Tune in (or read below) to find out why, for how long, and what you can do in the meantime to stay inspired and move toward your own Nomadtopia. As you can imagine, podcasting from the road has its challenges! And when I’m moving around a lot, I don’t know if I’ll have a quiet place to record, or how good the Internet connection will be, so it makes it more difficult to schedule interviews. I’m going to be moving around a lot in the coming months, first in Nicaragua and Costa Rica, and then in the U.S., so I’ve decided to take a short break from the podcast, and I’ll pick it up again in a couple months, probably in September. In the meantime, there are now 45 episodes of Nomadtopia Radio available, so there’s lots to catch up on if you haven’t had a chance to listen to them all. I’d also love your support to help get the word out! If you know anyone who’d enjoy this podcast, please tell them about it. And if you haven’t left a review in iTunes yet, I would so appreciate it, because that also helps other people find the show. Get in touch if you have any feedback, or would like to be on the show (or know someone who would be a good guest). I’ll be sharing my ongoing adventures on social media (especially Facebook and Instagram) and in my newsletter [you can subscribe at the bottom of the page], so we can stay connected there. Thanks again for listening to the show, and I’m excited to bring you more interviews with fascinating guests in the future. I’ll see you on the road, and back here in a couple months. Chau! And I’d love it if you could help spread the word using the share buttons below.